Wow! Very impressive. Have you been able to obtain the truth about what actually happened? My understanding is that a relatively simple road traffic accident caused by the usual poor standard of Israeli drivers has been blown up into this incident. Are the Hares 5 Boys not guilty of any involvement in this incident? As there are no real witnesses to the car accident except for the settler driver herself, there is no way for us to know what exactly happened on Road 5 on 14 March this year. However, everything (the boys’ testimonies, the truck driver’s comments right after the accident, the Israeli media storm, the judicial “process” etc.) is pointing into the direction you’re talking about: that a car accident was turned into this mockery of justice where nothing matters but the voice of those with political and military power. The boys all deny throwing stones and tell their families they had been forced to sign the confessions under conditions that amount to torture (2 weeks of solitary confinement alone is able to persuade anyone, let alone a child, to sign something that is not true – add to that physical and verbal abuse, wherein soldiers threatened the boys with harming their sisters and mothers). As far as we know, the Israeli police never carried out any investigation and yet the boys are facing these criminal charges. So yes, it’s our conscience that is to guide us. Ours says very clearly: Justice! Freedom for the Hares Boys! Thanks Miika. What does the article say? Sorry to have taken so long to reply to your question. 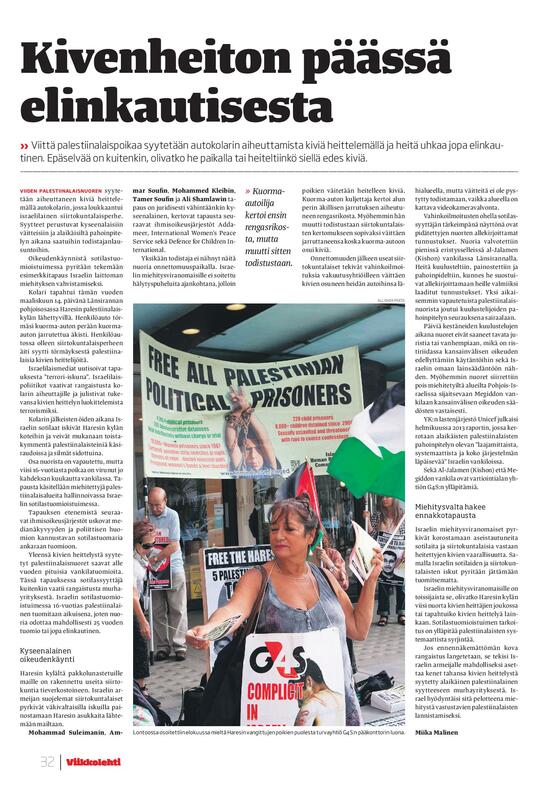 I work for ICAHD Finland and we try to enlighten the Finnish public with the realities of the Israeli occupation. My article is based on these sources: Addameer, Defence for Children International and International Women’s Peace Service. I write about the court case, I mention the lack of facts and witnesses and the change in the statements given by the truck driver. I write about the treatment of the five boys and also mention the UN report about the depth of the abuse of Palestinian children in Israeli jails. I end up saying that the truth of what happened, whether the boys were on site at the time or not and whether any stones were thrown or not, is not an important issue for the Israeli military court system. The main role of the military court is to maintain the illegal occupation and the systematic discrimination towards Palestinians, and with this case it can even strengthen it. Please feel free to check the text with a translator. Thanks so much Miika, this is wonderful. The military court system is indeed yet another tool of the occupation to maintain itself, while at the same time criminalising entire generations and intending to crush dissent. It is therefore extremely important that the world knows what is going on and acts in the name of justice.